July 23 represents the 50th anniversary of the 1967 Rebellion in Detroit. 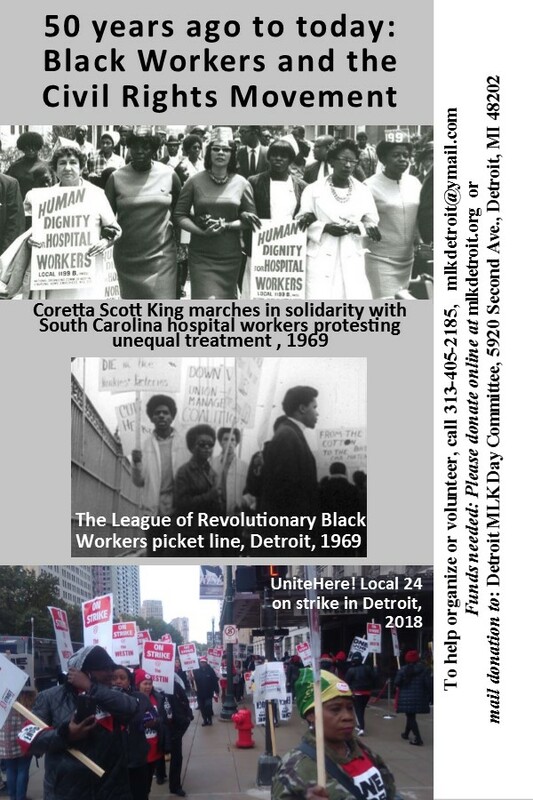 The five days of events had a profound impact on the history of the African American Civil Rights and Black Power movements as well as shifting the character of politics in the United States as a hold. 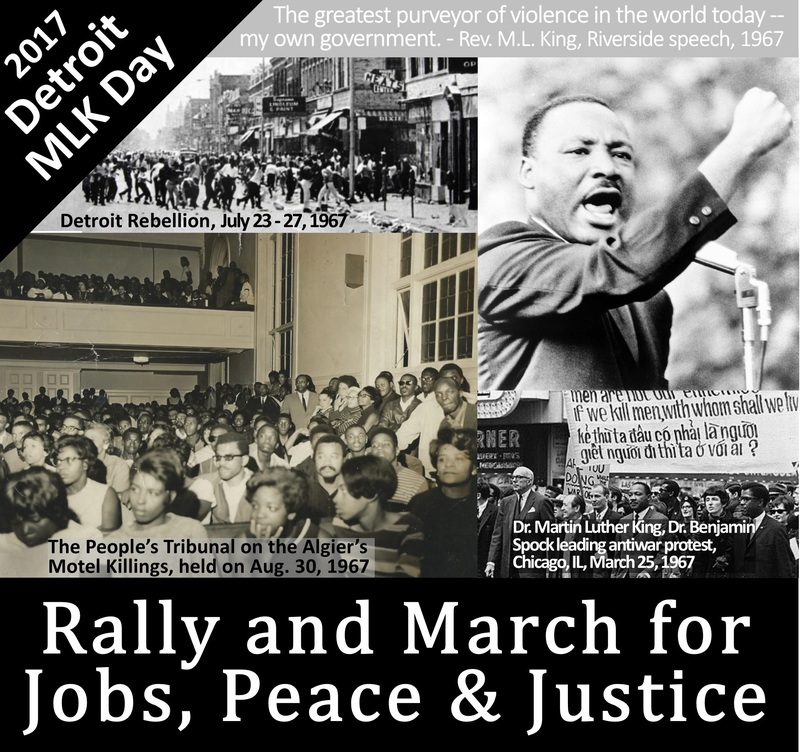 Join the Detroit Dr. Martin Luther King, Jr. Committee for a day of commemorative discussion and a tour on Sat. July 22. 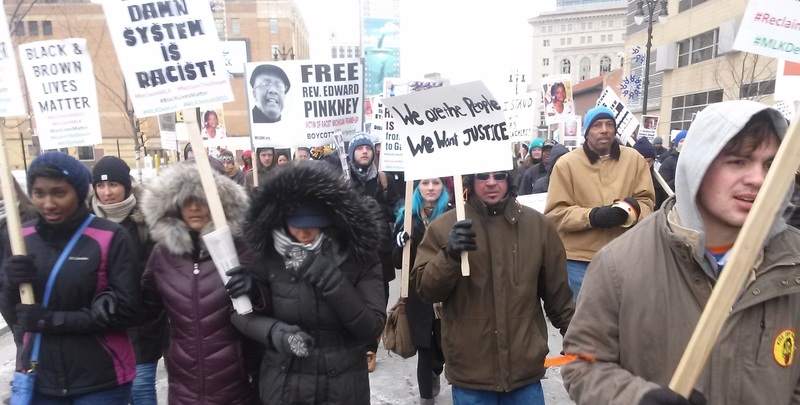 The event is designed to provide an accurate perspective on the social conditions that spawned the Rebellion and its influence on historical developments in Detroit, the U.S. and internationally over the last five decades. We will open with a community breakfast at St. Matthew’s-St. Joseph’s Episcopal Church beginning at 9:30 am. 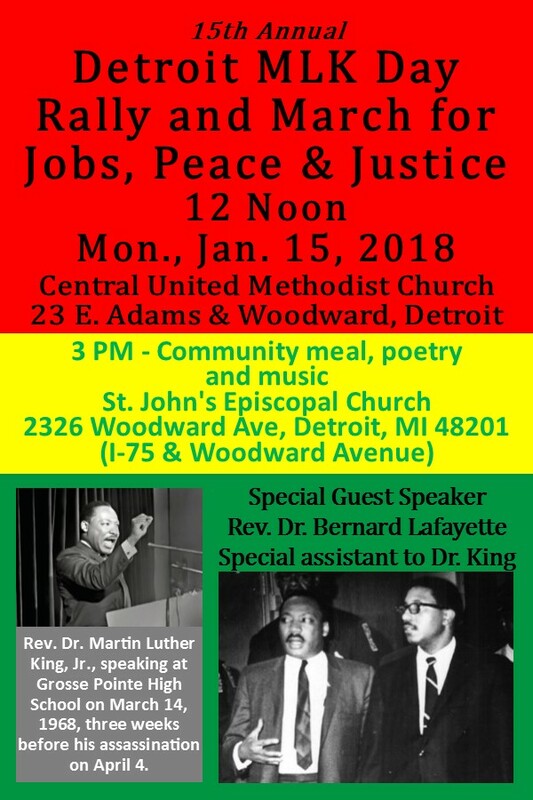 At 10:00 we will hear presentations by Dorothy Aldridge, chair of the MLK Committee, who was a Civil Rights and Community activist in 1967; Dan Aldridge, another well-known activist in the city since the 1960s; Aurora Harris, a member of the MLK Committee, a poet and higher education instructor; and Abayomi Azikiwe, editor of the Pan-African News Wire, and a co-founder of the Annual MLK Day Rally & March held in the city since 2004. Please RSVP for the tour since seating will be limited. We are requesting a $20 donation for the breakfast and tour. If people are unable to give $20 any amount is acceptable. No one will be turned away due to lack of funds. 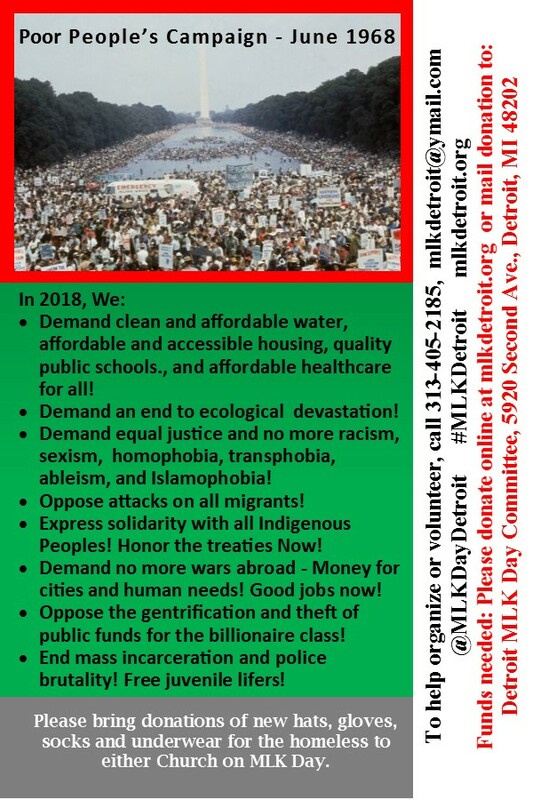 Mail check or money order to Detroit MLK Committee, 5920 Second Ave., Detroit, MI 48202. 3:00 pm – Community meal, poetry and music, at St. John’s Episcopal Church. 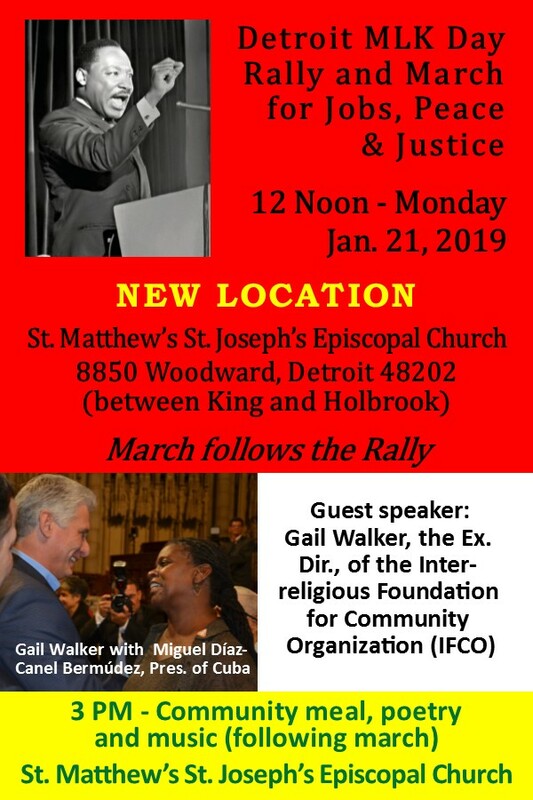 The Detroit MLK Day Committee, organizers of the Annual Detroit MLK Day Rally and March, request your support at our fundraiser in order continue the work of organizing this event. 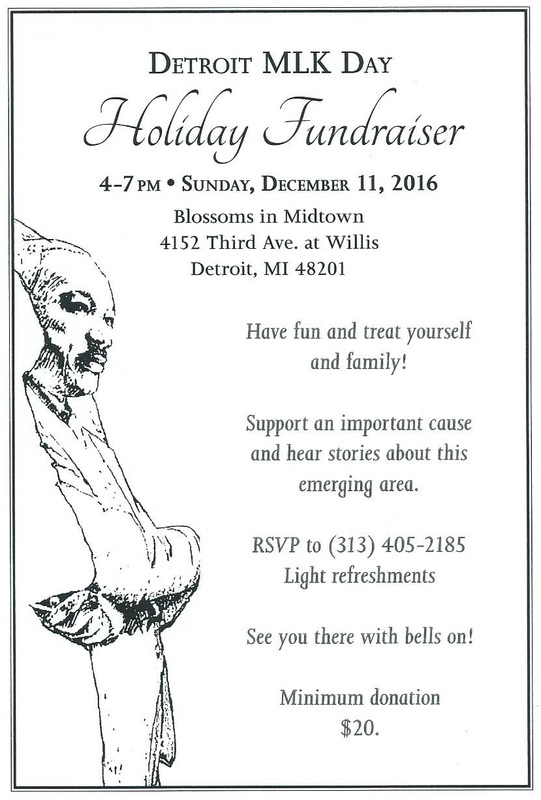 The fundraiser will take place at Blossoms in Midtown, located at 4152 Third Ave. at Willis, Detroit, MI 48201. Minimum donation is $20. There will be light refreshments. Please call 313-405-2185 to RSVP. Commemorating the 50th anniversary of the “March Against Freedom” and the “Chicago Freedom Movement.” JOBS, PEACE & JUSTICE!